Why is it called a Pondless™ Waterfall? Since the water level never pools above the level of the rock and cobblestone, it gives the appearance of a pondless or disappearing waterfall. Moving water is a magnet for birds and other wildlife. Are you interested in installing a water feature in your yard, but concerned about the safety and liabilities of having a pond? Or are you just interested in the sights and sounds of a waterfall or stream with extremely low maintenance? Well, we have the answer for you. 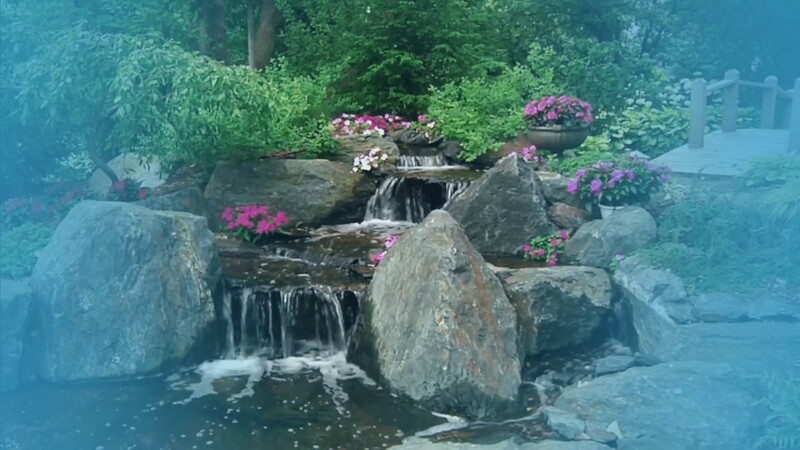 The Pondless™ Waterfall is basically that – a waterfall and/or stream, without the pond. Much like a pond, these systems attract birds, dragonflies and other wildlife. Water is the essence of all life on our planet and, while all beings need it for survival, why not make it look and sound beautiful as well! A Pondless™ Waterfall is the ultimate summer playground for kids. Move over Slip ‘N Slide! A Pondless™ Waterfall is sometimes a stepping-stone for people who might be interested in a full-fledged pond in the future. If your contractor is resourceful, they’ll make sure they leave enough room for a pond to be added later. A hole is dug, then lined and filled with a vault, AquaBlox, cobblestone and water. The water is then circulated from beneath the cobblestone by a pump that sits on the bottom in the vault. How does a Pondless™ Waterfall Circulate? The water held within the open spaces of the AquaBlox flows down toward the Waterfall Vault. From there, it gets pumped up to the top of the waterfall, where it flows by gravity back down through the cobblestone at the bottom . . . and the cycle beings again. If you have small children and safety is a concern, you can start with a Pondless ™ Waterfall. With the addition of a BioFalls, skimmer and larger liner, you can convert your system to a pond when the kids are older. Some people feel that taking care of fish would be a little too much of a responsibility, and that they won’t be able to leave their pond for long periods of time, while others say they do not have enough room for a whole pond. The Pondless ™ Waterfall is virtually maintenance-free! The cost of a Pondless™ Waterfall is usually less than a full-blown pond, and waterfalls can be placed on a timer for electrical savings. Freshen up the entrance to your office or home. A Pondless™ Waterfall can add great curb appeal to any home or business looking to add to the aesthetic value of their property. The lower cost and easy maintenance make this system an easy choice for those wanting to add some zest to their existing landscape plan. We are a master certified Aquascape contractor and have been recognized as the 7th largest Pond/Waterfall Builder worldwide with Aquasacpe, Inc. for the 2017 year and have been in the top 10 for the past decade. To get started with California Aqua Pros on building a Pondless Waterfall of your own simply contact us for a consultation. Looking to sign up for fall cleanout one time service?